Ayurvedic Treatment for Migraine Headaches | ND Care Nirogam Pvt. Ltd. If you say "I got Migraine too" we can stop the shows of the full-blown migraine attacks. We believe that Migraine can't beat you but you can beat it, NATURALLY!!!!! Dr. Navdeep Sharma, a world-renowned Ayurvedic healer, addresses migraine as an influence of vitiated 'Vata' (AIR). Based on several case studies, we have established that migraine can occur due to both constrictions and dilatation of the blood vessels. Naturally, due to consistent constriction of blood vessels induced by vitiated Vata, the brain of a patient acclimatizes to reduced blood supplies. During this consistent constriction period, if, for some reasons (oily/spicy food, prolonged exposures to sunshine, anger, stress, and grief) the blood vessels dilate to their standard diameter (a physiological change) to provide an adequate blood supply to the brain, causes a severe head pain known as migraine. Hence, our best natural Ayurvedic migraine treatment concept revolves around controlling the imbalanced 'Vata', which is the underlying cause of migraine. This mode of treatment is considered to be highly effective in curing migraines and mental exhaustion. Our treatment protocols have a profound impact on the nervous system of patients. Our prescribed medication allows their nervous system to experience a deep state of mental calm. Our tailored products have a very powerful detoxifying effect and help in treating migraine and associated throbbing pain. "The No.1 bestselling Ayurvedic solution for Migraine"
Pacifies excessive Vata in the nervous system. Treats memory fatigue, head pain, anxiety, and depression. Promotes Intelligence & removes toxins that can block mental abilities. It is an ideal remedy for students, seniors and anyone with a mentally demanding workload. A powerful neurological support that promotes blissful sleep. For fast action and target orientation, our products are enriched with nano-particles of Gypsum. Our prescribed medication are sugar-free, lactose-free, gluten-free, and contains no animal products. Our Ayurvedic herbal products contain a blend of neuro-relaxing Ayurvedic herbs such as a) Tulsi (Ocimum tenuiflorum), b) Shunti (Zingiber officinale), c) Pippali (Piper longum),Bhringraj (Eclipta alba), e) Ustukhuddus (Lavandula stoechas), and f) Ajmoda (Apium graveolens). a) Tulsi (Ocimum tenuiflorum): - Tulsi provides protection against the predominant causes of migraine such as chemical/physical/metabolic/environmental stress. Being an effective anti-depressant, Tulsi can potentially protect organs/tissues and blood vessels against psychological stress. b) Shunthi (Zingiber officinale): - Shunthi assists in the dynamic integration of the body, mind, and environment. It can potentially correct subtle imbalances. It is particularly effective in balancing the Vata Dosha, which is the underlying cause of migraine. c) Pippali (Piper longum): - Being a hepato-protective herb,Pippali controls the cardiovascular activities during migraine. d) Bhringraj (Eclipta alba): - Bhringraj is particularly helpful during severe headaches such as migraine. The regular use of this herb also normalizes the blood pressure. It is highly effective during Suryavartta(increased headaches with sunrise and vice versa). e) Ustukhuddus (Lavandula stoechas): - Ustukhuddus addresses the Vata imbalance which is the prime cause of the manifestation of migraine. This herb optimizes the blood circulation levels in the migraine patients. f) Ajmoda (Apium graveolens): - Ajmoda also helps in balancing Vata. It majorly acts as a cardiac tonic by regulating the blood supply from the heart to the brain. "In allopathy, the migraine pain is usually treated with painkillers and Non-steroidal anti-inflammatory drugs that just provide a temporary short-term relief from migraine. These medicines generate dependence over the time and affect the kidneys, liver or other vital organs. We do not support such dependency generating allopathic approaches for the treatment of Migraine. With our unique combination of herbal formulations, migraine patients receive relief from the first dosage." The allopathic view considers vasodilatation as the major reason for migraine. Allopaths believe that due to vasodilatations the blood supply to the brain exceeds its normal level, causing severe head pain. However, firstly, suppressing migraine pains with analgesics may give short-term relief but the pains will re-emerge. Secondly, it is not a healthy idea to put your body onmedicinal dependency. Thirdly, the drugs you take may engulf yourkidneys, liver, or other vital organs. Eliminate migraine naturally with Ayurveda! The holistic Ayurveda explains migraine as Tridoshaj disorder dominated by Vata Dosha. Vata: -Vata controls the brain activity as well as nervous system. Upon its vitiation, it causes migraine. Vata imbalance arises due to improper metabolism, poor elimination, mental and physical stress. Pitta: -A deranged Pitta causes frequent and inappropriate dilation of the blood vessels, which causes the onset of migraine attack.Pitta imbalance arises due to a bad dietary regimen and faulty lifestyle. The ancient scripts have also indoctrinated several causes which are actually responsible for migraine viz. over intake of oily/spicy/salty edibles, indigestion, drug abuse, and change in sleep patterns etc. The Ayurvedic treatment includes 1) elimination of toxins from the body, 2) improving gut functions, 3) balancing Vata and Pitta Dosha, and restoration of Ojas. The ancient treatment protocol leads to the reduction in the frequency/severity of attacks and gradual healing of migraine. The scriptures have mentioned powerful nervine tonics to nourish and strengthen the entire nervous system along with the Rasayana therapies to ensure proper blood circulation in the brain. "We administer the unique herbal combinations that have Vata pacifying effect - highly effective in treating migraines and mental exhaustion. 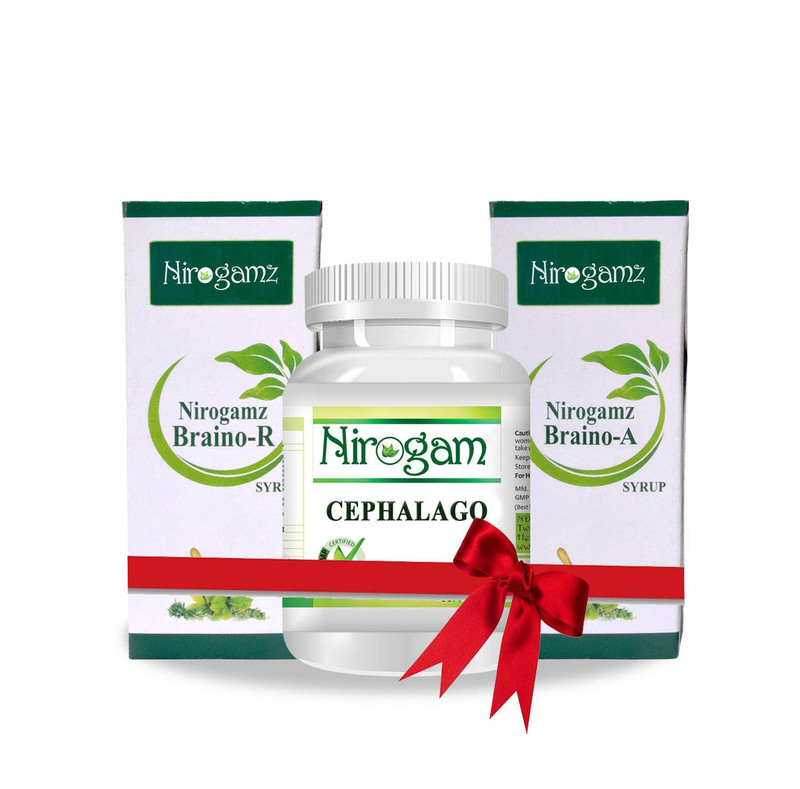 The anti-stress, adaptogenic, brain-nourishing, antidepressant effects of the nerve relaxing Ayurvedic herbs in our products are fast acting and target orientated. The patient experiences relief from the first dosage itself." To get migraine pain relief fast, do aerobic exercises in moderation regularly, it may make the interval of migraines shorter, less severe, and less frequent. To naturally cure the migraine aura, avoid stress and spend some time each day to relax. Drink more water and eat more fiber, fruits and vegetables, and whole grains. Avoid excessive sugar or salt, refined foods, animal products (meats and dairy), caffeine, tea, and alcohol. To decrease migraine pain relief medication, avoid direct exposure to the sun. Head massage with Bhringraj Oil is also beneficial for migraine treatment naturally. Good migraine treatment doctors will also suggest deep breathing and relaxation, especially in a lying down position in a quiet place. Inverted postures, or those where the head is lowered briefly, increase oxygen to the brain and can reduce headache-causing strain.